Pain and soreness of gums. In the early stages some may complain of a feeling of tightness around the teeth or having a sensation that the teeth are being wedged apart. Symptoms may appear suddenly as acute necrotizing ulcerative gingivitis typically develops rapidly. Poor oral hygiene or pre-existing inflammation of the gums that can lead to proliferation of bacteria in the mouth. Systemic (whole body) diseases like AIDS that weaken the body’s immune system. Smoking for nicotine causes narrowing of the blood vessels which reduces the blood supply to the gum tissues and therefore lead to higher chances for gum infection and damage. 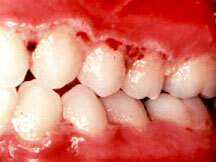 Trauma can expose the gums to infection. Psychological stress may alter behavior like decreasing oral hygiene, reducing saliva and blood flow and probably affect the immune function. Poor nutrition will lead to a weaker body defense mechanism that allows infection to spread more easily. For a normal healthy person with acute necrotizing ulcerative gingivitis, spread of the disease from the gums is rare. However for a person weaken by a systemic disease, ANUG can spread to surrounding tissues and cause a condition called cancrum oris or noma. Now acute necrotizing ulcerative gingivitis is relatively uncommon in industrialized countries; seen mostly in young adults but in developing countries, it is seen almost exclusively in children related to poverty and malnutrition. If you have any of the symptoms stated above, do pay a visit to your dentist to confirm whether you are suffering from acute necrotizing ulcerative gingivitis. A wrong diagnosis can lead to horrible consequences. Rinse the affected area with warm salt water to soothe the gums. Over-the-counter pain relievers may reduce the pain to a certain extent. Keep the affected area clean by gently brushing with a toothbrush. Cleaning your teeth; dead tissues, plaque and calculus will be removed. Prescribing antibiotics to reduce the bacteria. If metronidazole is prescribed to you, there will be rapid relief of symptoms but alcohol should be avoided and the drug should not be taken if you are pregnant. Some may experience side-effects like nausea, vomiting and flushing if on alcohol. Your dentist will give instructions to use a chlorhexidine mouthwash and advise you on proper oral hygiene care. Smokers should refrain from smoking or the symptoms may worsen. Once the acute phase has resolved, further treatment like deep gum pocket scaling and root planning will commence. 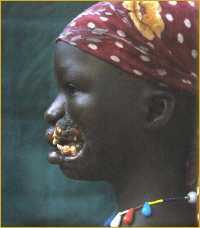 Deformity of the gums can be corrected by gingivoplasty in early cases and surgical flap procedures in all other cases. Upon completing the dental treatments, the condition should resolve in one or two weeks. If the condition does not resolve, an underlying condition may be suspected and further investigations and medical examination will be done to determine the exact cause.